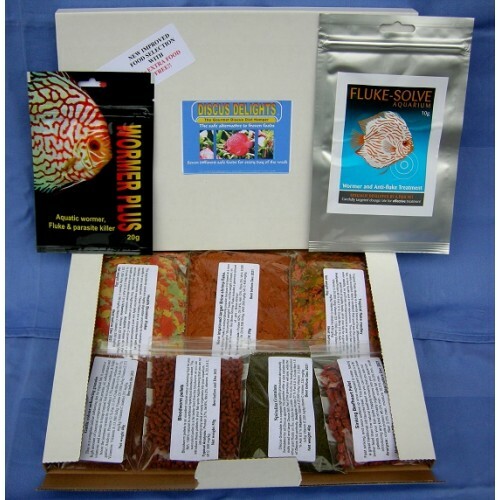 Discus Delights no frill's pizza box style Food Hamper, 1 x 20g pack of wormer plus and a Pack Of 10g Fluke Solve. Home » Food » Discus Delights Hampers » Discus Delights no frill's pizza box style Food Hamper, 1 x 20g pack of wormer plus and a Pack Of 10g Fluke Solve. Discus Delights No Frill's Pizza Box Style Refill Hamper pack, 1 x 20g wormer plus and a 550 gallon pack of fluke solve. ALSO INCLUDED IN THIS DOUBLE DEAL OFFER, A 20G PACK OF WORMER PLUS AND A 19G PACK OF FLUKE SOLVE.